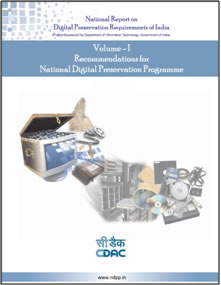 Human Centred Design and Computing Group of C-DAC, Pune was entrusted with the responsibility to produce the national study report on digital preservation requirements of India by Department of Electronics & Information Technology, Government of India during 2010-11. 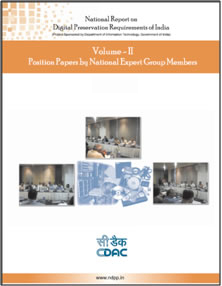 The report has been prepared by involving the domain experts from 30 stakeholder organizations across India in the form of Volume I and II as mentioned below. It is duly submitted with Department of Electronics & Information Technology for further processing and implementation. The report is yet to be released and made public. Digital preservation needs in diverse domains like e-governance, government archives, audio, video and film archives, legal, health, science and education, insurance and banking, cultural heritage, etc. Overall recommendations about national policy and strategy, R&D activities, approach to technology development, roadmap, etc.